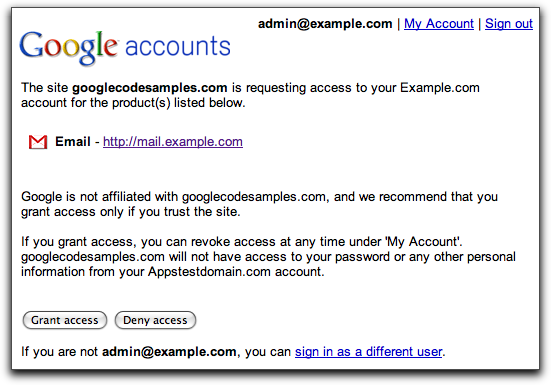 , Google Mail introduced IMAP access for all users. The only way to login to IMAP was with a Google password. Meanwhile OAuth, an industry-standard authorization protocol, has been developed. Websites have used OAuth to securely access a user’s data via Google APIs (such as contacts, calendars, and docs) once access is granted by the user. Today we are announcing the ability to authenticate to Google Mail IMAP and SMTP with OAuth. To do this, we created an experimental SASL mechanism called “XOAUTH”. OK, it’s not pretty, but we’ve got lots of sample code to help you generate the magic string you need to send us. The nice thing is that OAuth tokens are independent of user passwords, so they keep working through password changes. And you can worry a little less about the nightmare of hackers stealing passwords out of your database. Each OAuth token has a limited scope, and can be individually revoked by the user. We’re also working on an industry standard SASL mechanism for doing OAuth, and will roll that out as soon as it’s ready. We were so excited about the benefits of XOAUTH that we couldn’t wait to get it out there for people to use. To get started with XOAUTH, check out the Gmail site on code.google.com, which has documentation, a tutorial, and sample code. In 2007, Google Mail introduced IMAP access for all users. The only way to login to IMAP was with a Google password. Meanwhile OAuth, an industry-standard authorization protocol, has been developed. Websites have used OAuth to securely access a user’s data via Google APIs (such as contacts, calendars, and docs) once access is granted by the user. Today we are announcing the ability to authenticate to Google Mail IMAP and SMTP with OAuth. To do this, we created an experimental SASL mechanism called “XOAUTH”. the Google Apps Marketplace only a couple of weeks ago with great apps available from 50+ vendors. More than a dozen of these vendors have not only developed great apps and integrated them with Google Apps, but have also created some entertaining videos. Today we're launching a new YouTube channel at youtube.com/AppsMarketplace to showcase these videos. If you haven't already launched an app on the Marketplace, visit developer.googleapps.com to learn how to integrate with Google Apps. After you've published your app on the Marketplace, let us know if you've created a great video that showcases the app and its capabilities and we may feature it on the new YouTube channel. We launched the Google Apps Marketplace only a couple of weeks ago with great apps available from 50+ vendors. More than a dozen of these vendors have not only developed great apps and integrated them with Google Apps, but have also created some entertaining videos. Today we're launching a new YouTube channel at youtube.com/AppsMarketplace to showcase these videos.
. Partial response and update allows you to request and update feeds containing only the elements that you’re interested in. To request a partial response, you’ll need to add the fields query parameter to the end of the feed URL. To partially update a feed, you simply need to modify the partial request with your updates and submit it back to the server using HTTP PATCH. The HTTP PATCH method prompts for the requested changes to be applied to the resource defined by the request URL. To remove elements, partial updates can use the gd:field attributes, which specifies elements to remove before merging with the target source. The example below updates the event title and time. As you can see, the ability to partially request and update feeds greatly reduces the amount of data transferred, which is especially important in the mobile world. 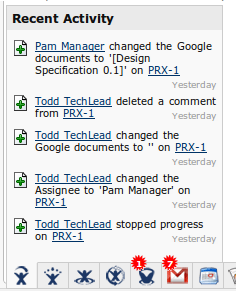 For documentation on Google Calendar partial response and update, please refer to our Developer’s Guide. We’ve also launched partial response and update for the YouTube Data API and Picasa Web Albums Data API and partial retrieval for the read-only Sidewiki Data API. For full details, please refer to our post on the Google Code Blog. Sometimes you’re only interested in specific elements from a Google Data API feed. With most APIs, you typically have to retrieve the entire feed and parse out the individual required elements. This can be very expensive for some applications-- especially mobile apps with limited bandwidth. We recently launched the partial response and update feature for the Google Calendar Data API. Partial response and update allows you to request and update feeds containing only the elements that you’re interested in. To put it simply: We are able to focus on what we do best, providing an easy to use asset management system, while Google does what they do best; providing secure, high availability servers. Like any platform, there are positives and negatives. But the flexibility and power of the system, allows for creative solutions. Since there is no “computer” that the code actually sits on, development of applications is done differently than on classic web servers (EC2, your own servers). With our former deployment on EC2, uploaded photos could be stored on a web server hard drive. Google App Engine doesn’t have a hard drive to access per se, but we were able to use Google Datastore, and store the photo as a data “blob”. Other platforms might not have allowed such a creative solution. Google Data Store is easy to work with. Below are code snippets that show how we upload and store pictures in the Google Data Store. 1.2. In code, create instance for class Photo and fill it. TIP: Google App Engine offers high availability by loading applications across many different “servers” in the platform. This allows your application to be instantly accessible when it is in frequent use. When an application is not getting consistent traffic, Google App Engine will “spin down” the application after some inactivity. 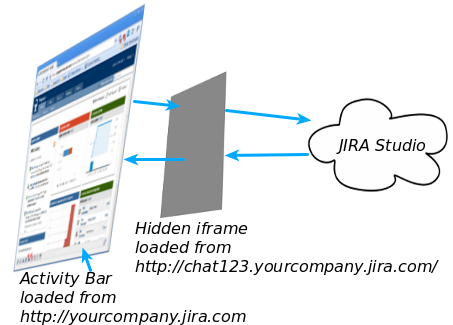 This can cause a slower initial load of the large complex applications. Compare it to revisiting a website with no “cookies” saved. After the initial load the application will run quickly once more. Getting Started Is Easy - Google App Engine is a platform, and it is different than programming on a server. There is a learning curve associated with development on GAE. Once our developers had a week or so to play around with the GAE, they found it is was very easy to program on it. Google supplies a Google Group that has a wealth of information from developers, with Googlers answering questions. We were able to make the port of EZasset in a shorter time then we expected. We also get all the great benefits of high availability, better server management, and security. Our asset management software is innovative, high quality, powerful and feature rich. We needed a platform that would allow us to continue to provide the high level of quality our customers expect. Google App Engine has allowed us to do that, and do it in the most secure, available platform. See EZasset in action at the Google I/O Conference in the Developer Sandbox. Editor's Note: This post was written by Paul Marsolan from StrongTech, an asset management company, and makers of EZasset. We invited StrongTech to share their experiences building an application on top of Google Apps utilizing some of our APIs. StrongTech Asset Management is a leading asset manager for federal agencies, institutions, enterprises and financial intermediaries, worldwide. StrongTech provides strategies and services that span the full spectrum of asset classes including: IT assets, wireless assets, weapons, healthcare assets, real estate, infrastructure, and energy. In 2009, StrongTech, makers of EZasset, made the decision to port our application from Amazon EC2 to Google App Engine for two reasons: security and server management. While Amazon EC2 is an excellent platform, due to our government contracts and growing business clients we needed the most secure platform possible. The Amazon EC2 is a raw nuts and bolts server system. The EC2 offers developers the same environment as if there were servers in a server room at the office. EZasset decided that we did not want to worry about backups, server patches, firewall settings, load balancing, scalability, or other issues. We wanted to focus on programing and offer a great product for a great price. We made the decision to let Google focus on the server and security management for us. What attracted us to the Google Apps Marketplace from the technical standpoint was the security offered through the Marketplace, and the scalability. We don’t need to worry if we have a thousand new clients sign up in one day: Google Apps Marketplace can handle our success. From the business side, getting EZasset in front of customers on the Google Apps Marketplace, and credibility of Google itself, are immeasurable. Millions of people use Google to find solutions for problems; it would have been foolish of us to not be a part of the Marketplace. Google services enhance our already feature rich applications. Integrating Google Calendar, Google Documents, and others, has allowed our software to be more powerful without sacrificing user friendliness. We use Google Calendar for maintenance tracking and notifications, Google Talk for real time communication, Google Docs for easy document uploads, and Google Spreadsheet for importing and exporting data into and out of EZasset.com. We’re even able to offer a robust support forum for our customers by using Google Sites. The security, ease of integration and scalability of Google Apps and the high availability of Google App Engine made porting an easy choice. EZasset has grown with Google, and now with Google's application marketplace, we can grow our business even more. event, we launched the new Google Apps Marketplace, making it easier for you to create applications that integrate deeply with Google Apps and sell them to the more than 2 million businesses and 25 million people who use Google Apps. In addition to the many integration points currently available for Google Apps, like the Google Data APIs, we announced that we will soon open Gmail contextual gadgets as a new extension point for developers. These gadgets can smartly draw information from the web and let users perform relevant actions based on the content of an email message, all without leaving the Gmail inbox. For instance, contextual gadgets currently available in Gmail can detect links in emails to show previews of documents, videos, photos, and more, right inside the messages. Appirio PS Connect shows how Gmail contextual gadgets can draw data from different web applications into relevant email messages, enabling users to make faster and more informed business decisions as they go through their inbox. At this week’s Campfire One event, we launched the new Google Apps Marketplace, making it easier for you to create applications that integrate deeply with Google Apps and sell them to the more than 2 million businesses and 25 million people who use Google Apps. Google Apps Script provides a powerful and flexible scripting environment that lets you automate actions across your spreadsheets, sites, calendars, and many other services. An important new feature of Apps Script is a script gallery, where developers can easily publish their scripts to make them accessible to everyone. You can find the gallery by going to Insert and then selecting Script...in any Google spreadsheet. Recently, the Google Apps team in New York put together a Movie Night script to help us easily figure out which movies were playing nearby and vote for our favorites - you can read more about it here. Let’s take a closer look at how the script works and how we published it to the new Apps Script Gallery. We start by bringing up the script editor from a spreadsheet (Tools -> Scripts -> Script editor...). In the spreadsheet, select Form -> Create a form to open the form creation window. Add two questions, one titled “Movie”, and the other “Attendee” - we don’t care too much about any other text as it will all be replaced by the script at run-time. 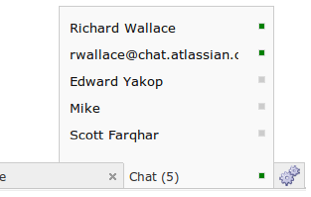 Close the form creation window. In the spreadsheet, select Form -> Go to live form, and copy the ‘formkey’ parameter from the address bar. Open the script in the editor, and insert the ‘formkey’ into line 2 of the script. Phew! That was the tricky part. In summary, we just created a form for the spreadsheet, but instead of using that form directly, we’re going to use a form that is dynamically generated by the script. However, we still need the special key to correctly route submissions to the spreadsheet (and to validate those submissions). Check out the documentation and get started building your scripts - we look forward to seeing your gallery submissions. To share your masterpiece with the world, select Share -> Publish Script...from the script editor - it's that easy! Also, for those attending Google I/O this year, be sure check out the Google Apps Script talk on the Enterprise track. ​Today, we are excited to make Google Apps Script available to everyone. 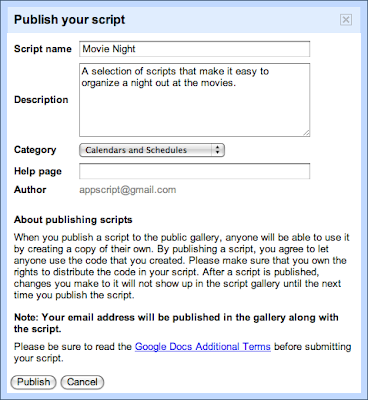 Some of you may already be familiar with Google Apps Script within Google Apps, but in case you are new to it, Google Apps Script provides a powerful and flexible scripting environment that lets you automate actions across your spreadsheets, sites, calendars, and many other services.
. It's benefits are ridiculously awesome, and how you would implement it is probably better to be left to Wikipedia to explain, since that's what I would paraphrase. Step 1: Create a class that implements the HistoryListener interface. It's really just one function, onHistoryChanged, in which you tell the app how it should render itself, based on the incoming state. Make it short; have your main class that does onModuleLoad implement HistoryListener. Step 2: Tell the History class that you have a class that wants to listen to changes in the History state. Let's do this in onModuleLoad(). Also, you can choose to fire off the current history state so your onHistoryChange method from above gets called on load. If it makes sense for your app, force it into an initial state, also shown here. Step 2.5: This isn't really a step. This part belongs to all of the development you would have been doing anyway. This is where you actually add code to your onHistoryChanged method to make it do something useful based on the state. // render the app appropriately for this state. // render it another way..
You can see how this would force state on your app. You'll find that in a lot of cases, you will be able to use traditional anchor links where you might have otherwise created a new Java function and binded it to the onClick event of some object or widget. Cool stuff. Let us know what you think, or ask Vinay a question, email vinay@ditoweb.com. Editor's Note: This post was written by Jim McNelis and Vinay Thakker of Dito, a provider of Google Apps deployment, training, integration, and support services, and makers of Dito Directory. We invited Dito to share their experiences building an application for the Google Apps Marketplace on top of Google Apps utilizing some of our APIs. You can meet Dito at Google I/O May 19 - 20 in San Francisco where they will be in the Developers Sandbox. The Google Apps Marketplace is a great sales channel that allows us to market our products to millions of Google Apps users. Dito Directory for Google Apps is just the first step for Dito's custom application development on Google technologies like Google App Engine, Google Apps APIs, and Google Web Toolkit. We are excited that Google is now providing us with an advantageous delivery platform for 3rd party apps. Dito, an IT solution provider specializing in Google Apps, was founded in 2007 by brothers Jim and Dan McNelis to help small and medium sized business enhance their IT infrastructure with cloud-based solutions. Since then, upwards of 40% of our customers have found us on the Google Apps Marketplace, so it was a logical choice to list our application there as well. The Google Apps Marketplace allows domain administrators to install Dito Directory with a couple easy clicks, making the purchase as painless as possible. Dito Directory uses OpenID for user authentication, which means no additional login is necessary. Once installed via the Marketplace, Dito Directory becomes accessible instantly for Google Apps users via Google's universal navigation. Dito Directory was developed as a result of customer demand for better contact management. We make it easy to import your existing contacts in bulk via the Google Spreadsheets API, which polls an admins spreadsheets and allows them to easily import existing contacts. As with all of our interactions with user and company data, we leverage 2-legged OAuth for authentication and OpenID for single sign-on. This allows our application to safely and securely access your information without the risk of compromising it to 3rd parties. 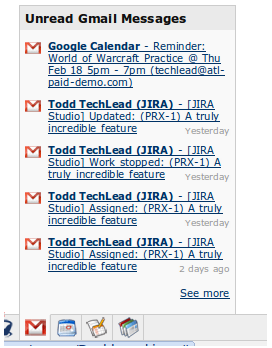 Sometimes, Google Apps users need more direct access to a domain shared contact's information. With the "Copy to My Contacts" feature in Dito Directory, admins and users can copy any domain shared contact to their personal contacts, instantly. If a users contacts are synced with their mobile device, the contact will show up on their device nearly as fast. Dito Directory interacts directly with a users contacts via the Contacts API. Enough about the what and the why...let's talk about how we developed Dito Directory. For that, Vinay Thakker, our Google App Engine-eer, is going to give you his perspective. Of course, I mean that in terms of adding features to it, since App Engine effortlessly handles the load distribution and scaling for us. As the client-side of our app grew, its statefulness became exponentially more difficult to manage. Most of our widgets needed to know about the state of other widgets. Generally, for UI elements, we do this using events. The number of event handlers required to obtain complete state communication in the application grows like the graph of a factorial with each additional widget (no kidding, it's painful). My initial design was the bomb, though. So, why change? The ease of using GWT makes developing event handlers a breeze, so in the beginning you may not realize what you're signing yourself up for. You can make a monstrous improvement by centralizing your event bus. In doing this, you should consider using the command pattern design. It's benefits are ridiculously awesome, and how you would implement it is probably better to be left to Wikipedia to explain, since that's what I would paraphrase.